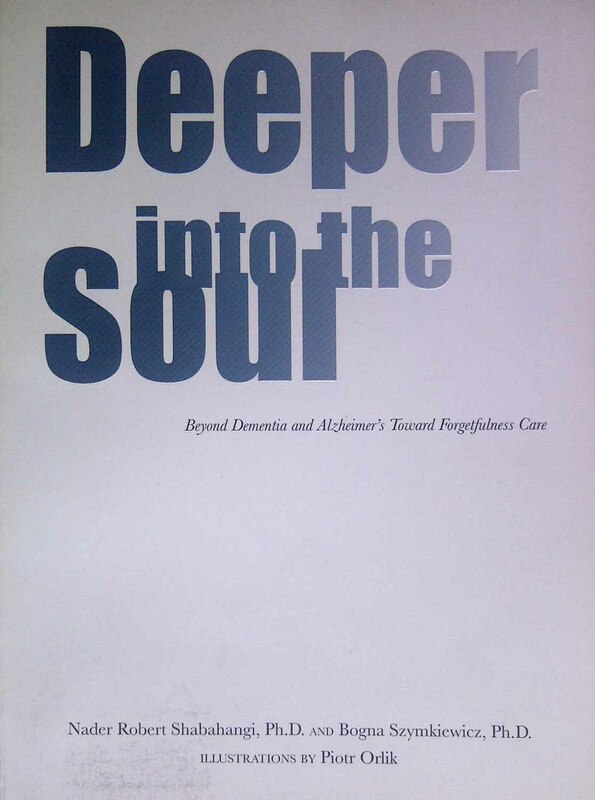 Blog REVISION of 2016 Dec 15: Four years ago, on Dec 15, 2012 finished reading (after many stops and starts because reading is progressively becoming more dificult for me) book about dementia titled “Deeper into the Soul” by Nader Shabahangi, PhD, and Bogna Szymkiewicz, PhD. … It was an EXCELLENT suprise; a distinct challenge to the current de-humanizing paradigm. One thing which facilitated my reading was the many illustrations included in the book. My first time reading the book, I merely read the graphics, giving me an idea of where the book was headed, and giving me a bit of a foundation for somewhere to put my thoughts, as I began reading the text. This has become my “go to” book, when folks ask me for my favorite book about dementia. Nader received his doctorate researching basic philosophical assumptions underlying present-day psychotherapies. He has worked extensively with elders, and dislikes the term “dementia”. He prefers term “forgetfulness”, which he employs in text. I would disagree on that point, because forgetfulness is actually such a small part of the dementia picture for those who have diagnosis such as Lewy Body Dementia or Frontal-Temporal Dementia. — Forgetfulness is an important element, but for me the hallucinations were a much more important element for the first several years. But I strongly appreciate some of the techniques this book suggested to me as a person with dementia symptoms: sitting with person (no words necessary), finding new meaning and purpose AFTER diagnosis, Where do most frequent brain changes occur, and what can I do to maximize use of the areas of brain which are most usually retained longest (like art & music) in my strategies for work-arounds in my daily routines? List some of my own communication hints (Part3 of book), as I encounter complications, that I can provide for others. Thoughts on the role of bereavement from loss of abilities, in my own progress with dementia symptoms. Nader definitely had a role in triggering not only this particular blog entry … but my decision to create a blog at all. THANK YOU !! * Admin issues: SHARE dementia awareness thru buttons below. If interested in receiving notice of future blog postings there is a “follow” button in the upper left corner (MS Explorer) or lower right (Safari and Chrome). Feel free to leave your thoughts in the form of comments, but please filter your comments with truthful loving kindness to all concerned. If there is an advertisement below, I have no control over what is shown. — Full legal name Truthful Loving Kindness copyright on 2014-08/06. This entry was posted in Reviews and tagged deeper into the soul, dementia, forgetfulness, Shabahangi, Szymkiewicz. Bookmark the permalink. I would like to nominate you for the VERY INSPIRING BLOG AWARD Truthful, because I love how you are so bright and determined. Your blog is an inspiration to others with Dementia because you show us how it is done getting on with things! You site has so much to it, information, education and of course much about yours which is beautiful to read.